Eco-friendly printer driver to save money on your daily print jobs. Save 33% in average of paper, ink and toner without any compromise on quality. Create Pdf files. Use the same preview printing dialog whatever the software you are using. Version 7.8.4.0 is a freeware program which does not have restrictions and it's free so it doesn't cost anything. For security reasons, you should also check out the GreenCloud Printer download at LO4D.com which includes virus and malware tests. Additional screenshots of this application download may be available, too. 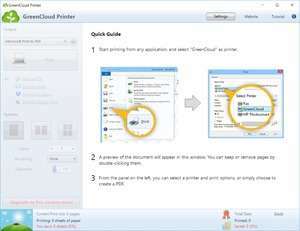 Featuring the very best in free printer software downloads. Editing staff adds reviews and free download links and constantly updates software. Check out some of the freeware downloads available in the printer software category. They contain no strings and are available at zero cost. 4 out of 5 based on 41 ratings.